Begin by speaking to Irena at the Shantay Pass. Firstly, head to the Shantay Pass (located south of Al Kharid) and buy a Shantay Pass from Shantay for 5gp. It's also best to gather all of the required items, along with some Desert Robes and Full Water Skins which you can buy from the shop. These items are necessary for surviving in the Desert for an extended amount of time. Go through the pass and speak to Irena, who will tell you that her daughter is missing. Tell her that you can help. Now go to the Mining Camp located to the south of the Shantay Pass. On the west side of the camp, you should see several Mercenaries and a level 21 Mercenary Captain guarding the entrance to the camp. Choose the "Watch Mercenary Captain" option on his right-click menu and you'll see that he has a Large Metal Key attacked to his belt. The best way to get the key would be to speak to one of the other guards and talking to him until you bring up a "useless loss of life." The guard will tell you that they don't like the Captain because he never fights his own battles. Speak to the Captain and ask if you can do anything "in return for his time." When he asks for the bandit leader, refuse, and then ask him why he can't fight his own battles. The guards won't attack you and you'll only have to deal with the Captain. Before going through the gate, make sure that you do not have a weapon, shield or any armour equipped. Some cosmetic items also count as armour, so to be safe try to wear nothing. If you do have a contraband item equipped, the guards will throw you in jail. Also, do not put anything else on while in the mining camp. While inside, avoid anyone with 'rowdy' in their name, as they will attack you. If you do find yourself locked up in jail, bend the bars in the window and squeeze out. Once inside, find the Male Slave in the back and talk to him. Tell him that you're new and he will tell you his plan for escaping. Help him and trade your Desert Robes for his Slave Robes. Put the robes on and enter the large door to the northeast, and you'll find yourself in the mining area. Follow the twisting passage until you find two gaurds, and speak to one of them. Tell him that you want to mine in a different area. Be nice and obey him or he will attack you! He wants a Tenti Pineapple. Leave the mines and the Mining Camp. Head west to the Bedabin Camp, and speak to Al Shabim in the large tent. Tell him that you are looking for a Pineapple, and he tells you that he will give you 1 if you get him plans for a new secret weapon. He'll also give you a Key to the chest containing the plans. Head back into the Mining Camp, put on your Slave Robes and go inside of the house. Climb up the ladder and search the table with the beer on it for the Jail Key, in case you happen to get caught. Search his bookcase to learn that he has several books about sailing. Try to open the chest and Captain Siad will stop you. Tell him that you want to have a chat, mention that he has lots of books, and then ask him if he's interested in sailing. Tell him that you could tell by the cut of his jib and he will be distracted. Now open the chest to obtain the plans. Bring the plans back to Al Shabim in the Bedabin Camp. He will ask if you can make the weapon for him, so tell him that you can. Head slightly north and try to go inside of the tent. The guard will stop you, but after showing him the plans he will let you pass. 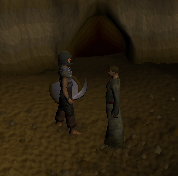 Use a Bronze Bar with the Anvil, follow the plans and you'll soon have a Bronze Dart Tip. Use 10 Feathers on it, give the prototype to Al Shabim and he will give you 6 Bronze Darts and a Tenti Pineapple. Head all the way back to the mine and give the guard the Tenti Pineapple. Enter the mine cave and walk east towards the barrels. Find the 1 that's empty by searching through them and then pick it up. Search the Mine Cart, climb in and you'll soon be in a new area of the mine. Head to the northwest and you should find Ana near a group of Slaves. Talk to Ana about escaping and tell her that you could sneak her out using a barrel. She'll tell you that there's no way she'll fit; just ignore her and use the barrel with her. Go back to the Mine Cart and place the barrel inside. Now climb in and you'll end up near the entrance of the mine cave. Search the barrels again to find Ana, and then use the barrel with the nearby Winch. Let the Mercenary help you, but Ana will start complaining. Just tell the Mercenary that he was "very gregarious." Leave the mines and head back into the camp. Head to the southwest corner of the camp. There you will find a Winch, around which several barrels are clustered. Operate the Winch, and then search the barrel that has that option. You will find Ana. Once you have found her, use her barrel with the Wooden cart to the northeast. Talk to the driver and tell him that he has a very nice cart. Tell him the joke "One wagon wheel said to the other 'I'll see you around!'" Continue telling jokes until he tells you to stop, offer him 10gp if he can get you out, and he says he'll do it for 100 coins. Agree and he'll drive you and Ana out. Now head back to Irena for your reward. Congratulations, quest complete! Slave Robes - you can always trade Desert Robes for more Slave Robes. Wrought Iron Key - for access to the deeper mines. Ability to Mine in the Slave Camps. Ability to Smith Throwing Darts. 4,650 experience in each of 2 skills chosen by you: Agility, Fletching, Smithing and Thieving.